The name probably refers to a grouse or moorhen [DUPN]. Slievekirk is the 1014th highest place in Ireland. I followed Mr Goodman's directions for an ascent from the south, having first checked out the possibility of coming in from the NW from the highpoint/road junction at (449 088 G). This was comprehensively rejected; there are big changes afoot on this top. 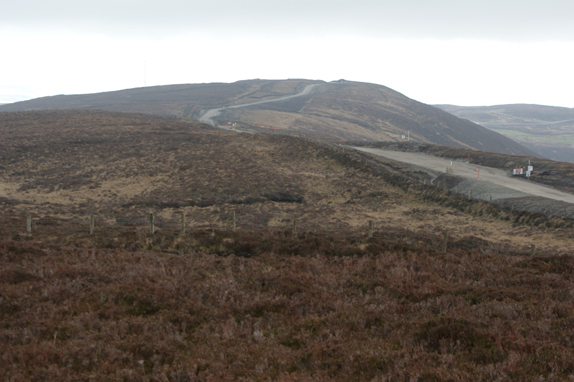 A huge windfarm is in the process of construction on the ridge to the E of Slievekirk, and the livid access road/track for those works (currently very busy with heavy plant vehicles and hard-hatted gentlemen) runs from that junction up onto the hill and along the crest. It passes within yards of the summit, but somehow doesn't seem very welcoming even if there was no objection to its use (I didn't ask).